Maker's Mark, ice and a glass. I call it....a Honey of a Whisky Sour. It's made with honey simple syrup, which sounds really fancy, but it just honey heated up with water. 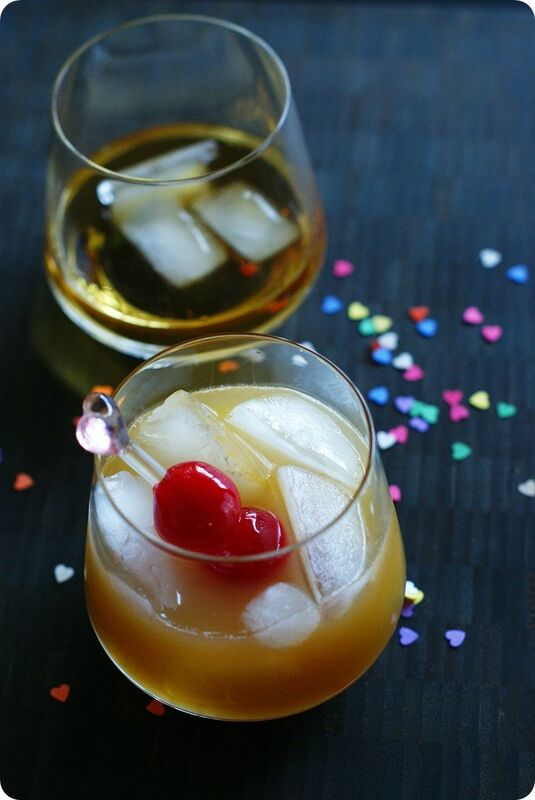 Maraschino cherries are a MUST in my cocktail book. And, you'll want need some OJ and a lemon. 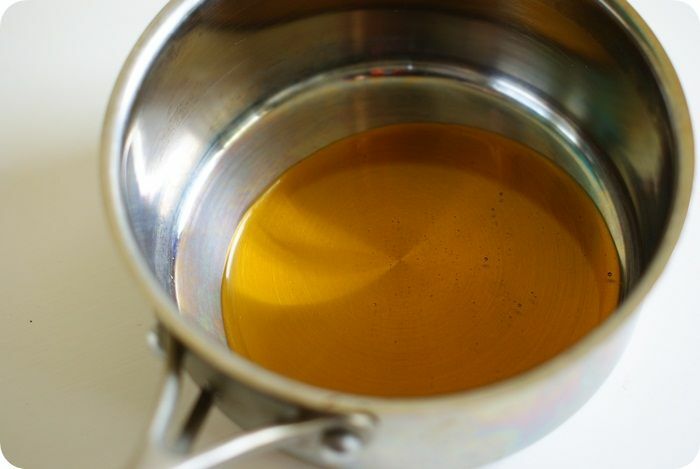 For the simple syrup, combine the honey and water in a small saucepan. Bring to just a simmer, then remove from heat and let cool. Store in the fridge. 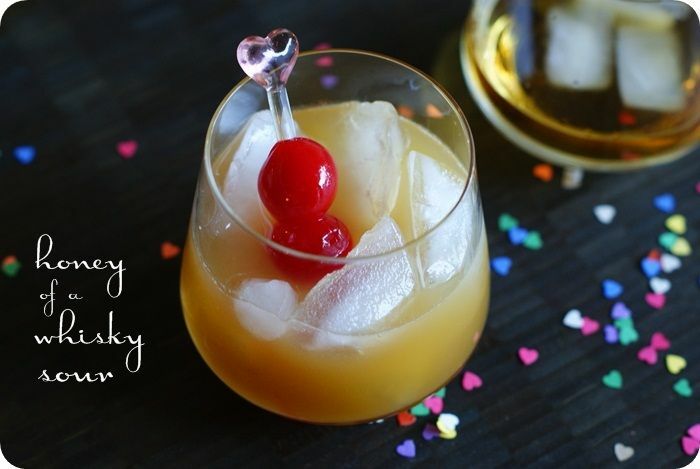 For the cocktail, whisk all of the ingredients, except the cherries, in a bowl (or use a cocktail shaker filled with ice). Pour over ice. Add cherries, they're mandatory. 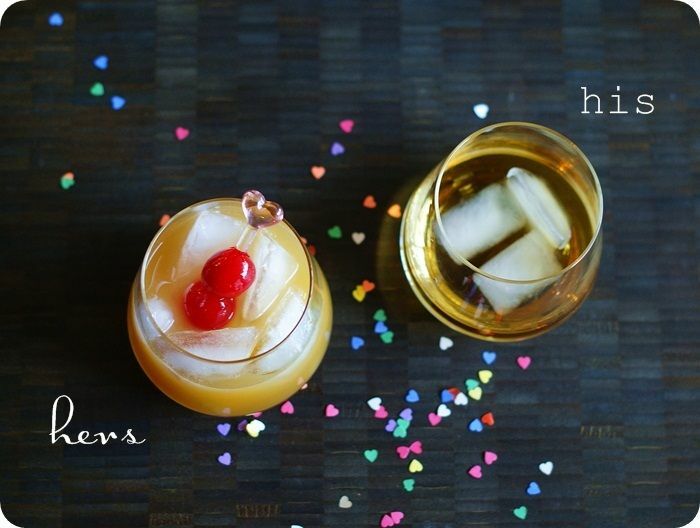 Perfect for New Year's Eve, Birthday Eve, or Saturday Eve! From Mr. E & me to you....CHEERS! May 2013 be your best year yet. Happy New Year to you and Mr. E! This is my ultimate drink! And a drink stirrer with a HEART! I"m on my way to THE WOODLANDS! I love your little heart decorations! Happy new year! Mr. E gives me goose bumps! This looks so tasty! I have a question though, you don't use all of the honey/water mixture do you? Add it just to taste? I love honey but have never thought to make a drink out of it. This looks perfect-o-mundo! Save one for me. I'm grabbing my shoes and some honey. How festive! I love the heart confetti. Happy New Year! Bourbon is the best! 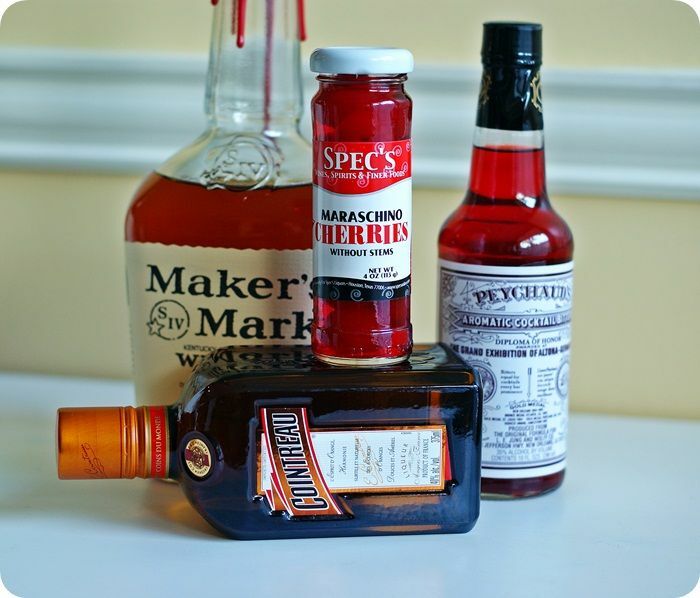 Great way to dress up bourbon simply and as a fun cocktail. Happy New Year. Ohhh, i love this! Great idea. I betcha my man would want the whisky sour though. Oh well, i guess the duality is shot. Your husband's cocktail is identical to my husband's! Yours looks fantastic, although I'm not sure how hubby would react if I started using his beloved Maker's Mark! Mmm, I'd probably reach for the gentleman's drink - looks perfect! 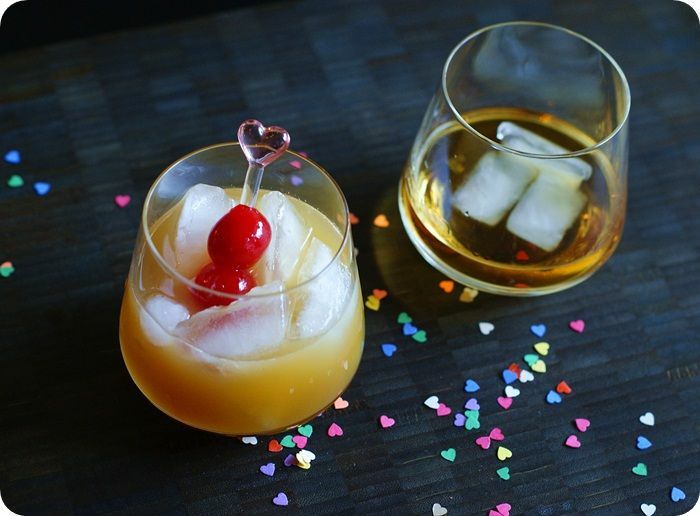 Just like you and Mr. E., these cocktails are a match made in heaven. Happy New Year Bridget, may 2013 be as gentle and as sweet to you & your family as you are to everyone. The cocktail sounds lovely! You always take great photos, but that first picture is so pretty I would hang it on my wall! Ahh looks so good, Bridget!! I would like one of these right now! Happy New Year to you!!! I am looking forward to trying this cocktail. 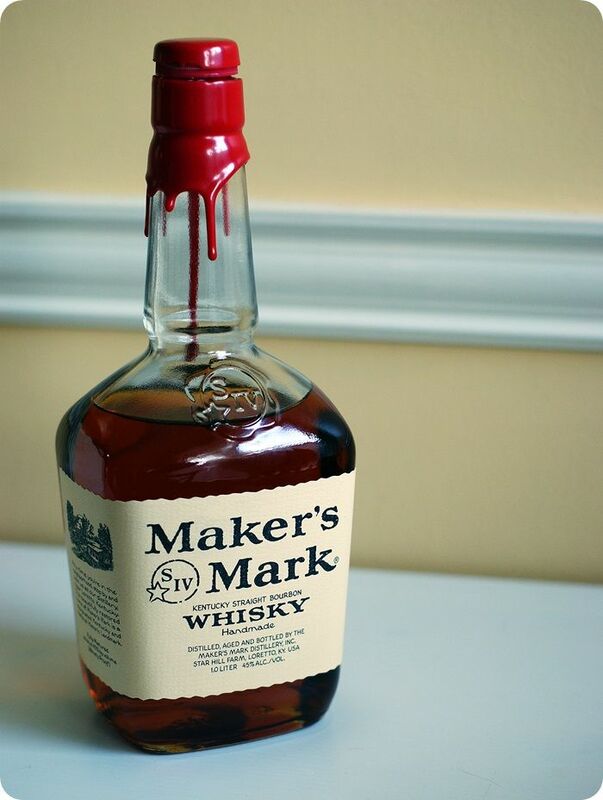 I have Makers Mark on hand and use it often to cook with. It makes a great spirit of choice in PW's whiskey cream sauce. Oh my! So gonna make this cocktail! I love how simple yet delicious it sounds. Thanks for sharing.